In this article, we are going to talk about the ignition coil, so you will know its basic functions, symptoms of a bad ignition coil, how to test, and also the average replacement cost. Ignition coils are known as compact electrical transformers. Their purpose is to take the low 12-volt current normally found in car batteries and convert it into a much higher voltage which is needed to ignite the fuel and start the engine. Each spark plug in a car has its own ignition coil. The coil is either physically connected to the spark plug with wires or it sits on top of the spark plug without using wires. The spark plug needs about 15,000 to 20,000 volts of electricity in order to form an electric spark that can ignite the fuel. If you don’t have strong ignition coils then it will result in weak fuel consumption or engine misfires. It’s important to note that a troublesome ignition coil can also be related to a low voltage or abnormally high voltage battery. This will also cause a range of other issues with the car and upgrading it to a new battery can see many issues go away. Many batteries found in older cars can simply breakdown with age and one sign of a bad battery is if it’s not reading at least 12.65 Volts when fully charged, you know there are issues with the battery. Here’s a good, 3 minute video demonstrating how an ignition coil works. Or simply scroll down to see read about the signs of a bad ignition coil. 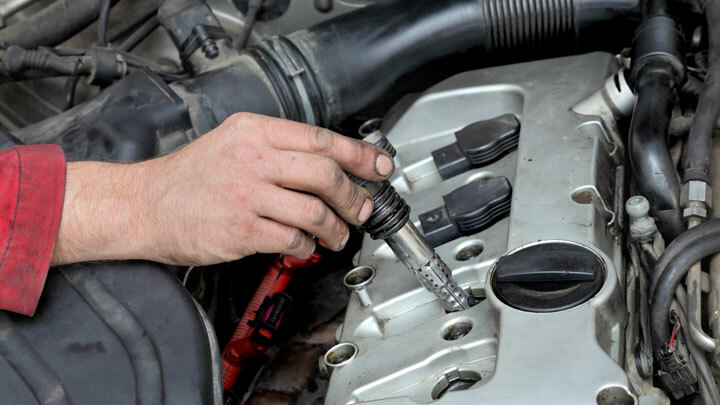 If a vehicle is behaving intermittently and is giving its driver some trouble in a smooth driving, then it could indicate that the ignition coil of that vehicle has gone bad. The failed or weak ignition coil symptoms may vary depending on the severity of the ignition coil failure. Here are some of the most common symptoms of bad ignition coil. Backfiring caused by your vehicle can indicate the symptoms of the ignition coil failure in its early stages. Car backfiring occurs when the unused fuel in the combustion cylinders of the engine leaves through the exhaust pipe. If this problem is left unchecked, then it can result in costly repairs. The backfiring problem can usually be detected by the emission of a black smoke through the exhaust pipe. The smell of gasoline in that smoke may also give away the ignition coil failure. Another sign of a faulty ignition coil is poor fuel economy. If your vehicle is getting noticeably less mileage than it was before, then it could mean that an ignition coil failure has occurred. Engine misfiring will be seen in a vehicle whose ignition coils have failed. Trying to start the engine of such a vehicle will result in engine misfiring that sounds like a coughing, sputtering noise. When driving at high speeds, jerking and spitting will be seen in the behavior of the vehicle. A vehicle with a failed ignition coil will also result in vibration when it is idling at a stop sign or light. Ignition coil failure may also result in the stalling of that vehicle. This can occur because of the irregular sparks sent to the spark plugs by the faulty coil. Your car may shut off completely when brought to stop leaving you with the trouble of it hopefully restarting. Another symptom is rough idling of the engine, jerking, and hesitating while accelerating. It will feel like your vehicle is missing some power when driving. Often, the check engine light will turn on in your dash. Most commonly, engine code P0351 (Ignition Coil – Primary/Secondary Circuit Malfunction) is what shows up when scanned using a car diagnostic tool. Scanning for the error code is probably the easiest way to troubleshoot a coil issue, so if you see that check engine light, grab your scan tool or have a repair shop confirm. A hard to start engine is a symptom that will occur especially if your car uses a single coil. If the coil has a malfunction, it means the engine will be cranking without sparks inside the cylinders. The cost of a new ignition coil depends on the make and model of the car. Some coils are as cheap as $75 while others cost in the $300 range. If you have the replacement professionally done then the labor costs will be between $50 and $100 per hour. Therefore, you can expect to pay at least $150 to $200 if you were to take your car to an automotive repair shop and have them replace your ignition coil for you. If you choose to go to a dealership, expect to pay even more. Here are some tips on testing an ignition coil based on whether they are a CNP (Coil-Near-Plug) or COP (Coil-On-Plug). To run a test on an ignition coil, first turn off your car’s engine and open up the hood. Remove or pull the spark plug wire from it (if you car uses CNP coils). These wires typically start from the distributor cap and run to the spark plug. Use rubber gloves and insulated tools when working with these electrical components or you may get a nice jolt. Now attach the new spark plug to the spark plug wire (new or old spark plug to test coil sparks). Use insulated pliers to hold the spark plug onto some metal part of the engine so that the threaded portion of the spark plug is touching the metal. Use a fuse removal tool or needle nose pliers to remove the fuse to the fuel pump to disable it and get ready to crank the engine. You may need an extra person to turn the key in the ignition because you are holding the spark plug down with the pliers. Once the engine is cranked, look for blue sparks forming along the spark plug gap. If you see blue sparks then your ignition coil is working properly. If you don’t see the sparks or if you see orange sparks then this is a sign of the ignition coil malfunctioning. When you’re done with the test, disconnect the spark plug, place it back in its hole, reconnect the spark plug wires to it, and put back the fuel pump fuse. Keeps the engine running at idle speed. Open the number 1 ignition coil bolt, and then pull up the coil to see how the engine runs. If the engine’s condition changes to rough idling, that means the number 1 ignition coil is good. Then you can continue this step with the remaining coils one at a time until you find the culprit. When you pull out a faulty ignition coil, the engine condition/idle should not change. My BMW E39 520i would rumble everytime I started him up in the morning. I took it to a mechanic and been advised that 6 coils need replaced, (6 of them thats a coincidence isn’t it)…I got quoted $1680 to replace them incl labour and gst (NZ goods n services tax). I went online after that chat with the mechanic and looked around for BMW ignition coils, pkt of 6 would cost -wait for it $344…am i getting ripped off? or am i looking at the wrong product? I dont have alot of spare cash for repairing this car so im stressing a lot about it, and just want a driveable car. The rumble is just the beginning. Prepare for stress and come up with a plan on how to deal with it. Those cars can be bought for cheap, but usually will cost $10,000 a year in “maintenance” to keep as a drive-able car. I bought a used 520i for 6 grand, found out it had some issues, and had a 8 grand bill a week later. Any time a repair bill is more than 50 percent of a cars value, especially a German car, get rid of it. I spent more time with the BMW in a tow-truck than in the driver’s seat. You know, it was the ultimate driving experience. Tow-driver and mechanic knew me on a first name basis; I was like part of their family; they became very expensive friends. One day the mail man asked me if I worked in the shop as I was there all the time when he delivered packages – I often signed for them when the mechanic was working on my car. Those exotic BMW plastic parts are expensive and often require a signature for proof of delivery…Never again. For my last repair, I told the tow-driver that this would be the last time I would tow it for a repair. The next time it would be towed would be to a junk-yard; I kept my word. A month later, there was a major issue with the engine burning as much oil as gas, and a week after that the fan belt tore and ripped off the water pump and the car overheated in less than 20 seconds. I called the tow-man to haul it away. During this incident, I was waiting on the side of a busy interstate during rush-hour for hours. Tow guy almost got hit by a car trying to help! I donated it to a trade school for mechanics (to hopefully keep it off of the road and from being sold again) and I celebrated the day it was taken away by taking my wife out to a steak dinner! I can relate to some BMW issues. While I didn’t have a 5 series, my E36 M3 was probably the most fun to drive car I’ve ever owned when running but also the most expensive to fix when things went wrong. Hi there…My BMW E39 520i would rumble everytime I started him up in the morning. I took it to a mechanic and been advised that 6 coils need replaced, (6 of them thats a coincidence isn’t it)…I got quoted $1680 to replace them incl labour and gst (NZ goods n services tax). ALSO NOTE ON THE COST, SOME CARS HAVE MORE THAN ONE COIL, SUCH AS ONE FOR EACH SPARK PLUG, SO FOR INSTANCE ONE COIL CAN RANGE FROM $50-120 AND THEN ADD LABOR COST. TO REPLACE SIX COILS IS JUST UNDER AN HOUR OF LABOR. Also important to note regarding cost, some cars have 6 coils, one for each spark plug, so you are looking at 6 times the cost of the plug plus labor. Ignition coil has gook or gunk inside. Not sure where it’s coming from. I have a 1987 Volvo GLE non turbo. It starts fine when cold, but then after a bunch of driving will stall and not restart for a few hours. No start can also be triggered if you let it idle for a bit and try to restart it. It turns over strong, fuel pump shoots fuel through the lines and the filter is fine, but it just won’t start. After a second of cranking the fuel pump sounds like it is straining… Would a coil cause this? Some Chevy 6’s will run rough if the dirty oil isn’t changed. The ignition system and the AC system are two different systems. IF YOUR AC system isn’t blowing cold air I’d suggest you take it to a vehicle repair shop that have ac system certified. A mechanic has to be ac certified to work on an air conditioning system on your car do to the fact that the ac system is a closed system with refrigerant in the ac lines. If you air isn’t blowing cold means u may have an ac refrigerant leak some wear or need new refrigerant added to the ac system with a special ac refrigerant mechine. Pretty high mileage. Never changed plug’s yet 2001 Jeep Cherokee. Should I just go ahead and change coil’s and plug’s and be done with it. Quit’s running after running awhile. i have a 2000 silverado z71 4w drive 5.3 and just replaced the plugs, wires and put 40000volt coils on it ..ive drove it twice since said repair and both times ive gotten roughly the same distance before the temp gauge gets eratic and the engine starts to act like it wants to stall and gets jerky…about 20 min on the highway at 60 mph the first time i got to my dest. and shut it off and it wouldnt even start up…….im fairly competent when it comes to engines but ive noticed NO leaks or wires undone …….HELP!!! Did you scan for any trouble codes? It should tell you where the misfire is occurring. My car has no power to drive up-hill, could it be the faulty coils? the mechanic has advised that they need to change. I was just wondering if the failure to climb the hills is due to the coils.